Kluckingbear: Get Out Your Halloween Scraps! Get Out Your Halloween Scraps! I love October. I love Halloween. I love the colors, the ghoulies, the ghosties, the candies, the blood & guts, I love it all! 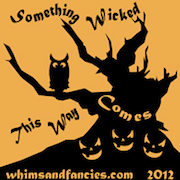 Halloween Paper Piecing Blog Hop! Free Halloween-themed paper pieced blocks the entire month of October! Today's block is the cutest (or evilest depending on your embroidery spin) hanging bat.